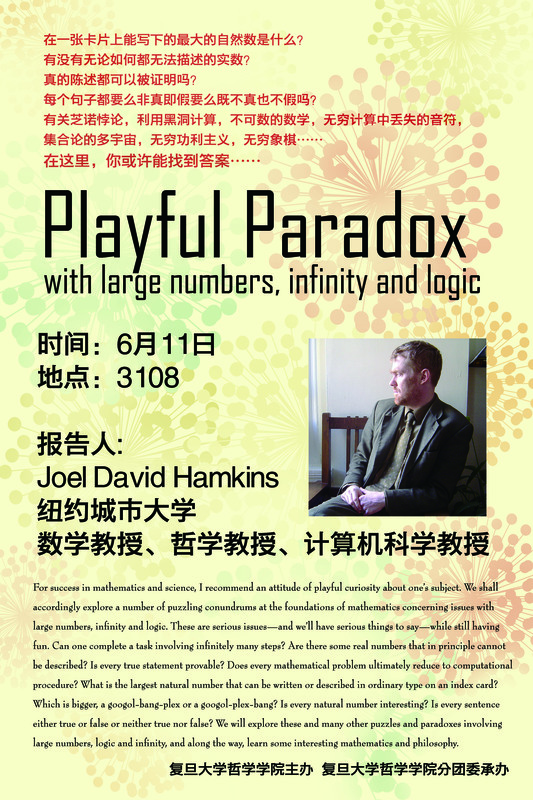 This will be a talk at Fudan University in Shanghai, China, June 12, 2013, sponsored by the group in Mathematical Logic at Fudan, for a large audience of students. Abstract: For success in mathematics and science, I recommend an attitude of playful curiosity about one’s subject. We shall accordingly explore a number of puzzling conundrums at the foundations of mathematics concerning issues with large numbers, infinity and logic. These are serious issues—and we’ll have serious things to say—while still having fun. Can one complete a task involving infinitely many steps? Are there some real numbers that in principle cannot be described? Is every true statement provable? Does every mathematical problem ultimately reduce to computational procedure? What is the largest natural number that can be written or described in ordinary type on an index card? Which is bigger, a googol-bang-plex or a googol-plex-bang? Is every natural number interesting? Is every sentence either true or false or neither true nor false? 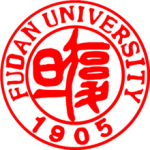 We will explore these and many other puzzles and paradoxes involving large numbers, logic and infinity, and along the way, learn some interesting mathematics and philosophy. The Largest-Number Contest. In preparation for the talk, and with a nod to Douglas Hofstadter, we shall be holding a contest: Who can describe the largest number on an ordinary index card? See the contest announcement poster. A submission entry consists of the description of a positive integer written on an ordinary index card, using common mathematical operations and notation or English words and phrases. Write legibly, and use at most 100 symbols from the ordinary ASCII character set. Bring your submission to the talk. Descriptions that fail to describe a number are disqualified. The submission with the largest number wins. The prize will be $1 million USD divided by the winning number itself, rounded to the nearest cent, plus another small token prize. The population of Shanghai at this moment. Read a more detailed account of the contest and its results. 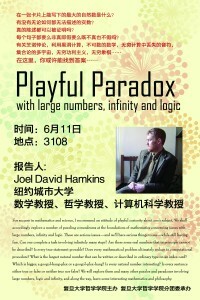 This entry was posted in Talks and tagged Fudan University, googol, googol plex bang stack hierarchy, infinite games, largest number contest, paradox, playful paradox, Shanghai by Joel David Hamkins. Bookmark the permalink.